In a sharp rebuke from one of America's closest allies, Canadian Prime Minister Justin Trudeau criticized the White House rationale for imposing punitive trade tariffs on Canada as "insulting and unacceptable," the latest leader to warn of a looming trade war with the U.S. The complaint, which aired Sunday on NBC's "Meet the Press," was a dramatic departure from the conciliatory approach Trudeau has shown to President Donald Trump over the last year, and signaled the growing pushback from U.S. allies to the protectionist trade policies. Trudeau denied on "Meet the Press" that Canada or its steel and aluminum industries posed any such menace. Canada is one of America's largest trading partners and one of its closest military and political allies. "The idea that we are somehow a national security threat to the United States is, quite frankly, insulting and unacceptable," Trudeau said. 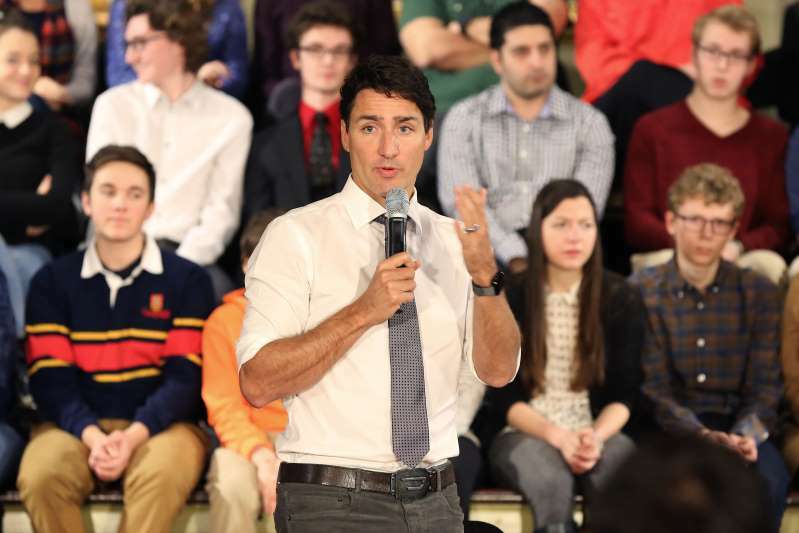 "We're putting the same kinds of tariffs exactly on steel and aluminum coming from the United States into Canada to be directly reciprocal," said Trudeau. "But we're also putting a number of tariffs on consumer goods, finished products for which Canadians have easy alternatives." "One of the truths about tariffs is they drive up costs for consumers," Trudeau said. "And on top of that, these tariffs are going to be hurting American workers and Canadian workers." Other allies have denounced the tariffs in similarly harsh terms. French President Emmanuel Macron, who has publicly embraced Trump several times in public, told reporters Thursday that Trump's decision to impose tariffs "is not only unlawful but it is a mistake in many respects." "Economic nationalism leads to war," he warned. Mexico Foreign Minister Luis Vinegary labeled the tariffs "unjust and unilateral" but said Mexico will continue to negotiate with Washington to revamp the North American Free Trade Agreement. Trump has made no secret of his overriding concern about U.S. trade imbalances, viewing them as a sign of American weakness around the globe. The tariffs are unusual because they target some of America's closest allies. "The idea that our soldiers who had fought and died together on the beaches of World War II, on the mountains of Afghanistan and have stood shoulder to shoulder in some of the most difficult places in the world, that are always there for each other, this is insulting to that," he said. Trudeau, who took office in 2015, is expected to press his case directly with Trump next weekend when Canada hosts the annual Group of Seven summit, which brings together leaders of the world's largest economies, in Quebec. The White House on Sunday pushed back against the notion that Trump's trade moves were unfair or irreversible. "Good-faith negotiations are welcome, and we hope to continue there," Larry Kudlow, the president's top economic adviser, said on "Fox News Sunday." He said Trudeau was "overreacting" to the new tariffs. "I don't think our tariffs are anything to do with our friendship and longstanding alliance with Canada," Kudlow said. "So I don't think things are broken down," he added. House Majority Leader Kevin McCarthy of California also defended the tariffs, saying Trump was "standing up" to protect U.S. interests. He also denied the confrontation could be considered a trade war at this juncture. "We are in the middle of a trade discussion - nobody wants to be in a trade war," McCarthy said on CNN's "State of the Union." "Nobody wins a trade war," he said.